Having a new piece of music specially written for your choir or community can be a powerful and memorable way of marking occasions such as a festive liturgical celebration or an anniversary, and can also make a thoughtful farewell or wedding gift. 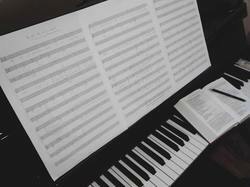 Liturgical composers have been called the "unseen collaborators" in worship, and commissioning a work can provide a valuable opportunity to work closely alongside the composer. This ensures that the final product is ideally suited to your situation - written especially for the performing forces at your disposal, number and type of voices, instruments etc. Recent commissions include a blessing for a wedding, and an instrumental work celebrating 150 years of the Marist Order in Samoa. If you are interested in commissioning a piece, feel free to make contact! The cost and timescale involved vary depending on the size of the project.